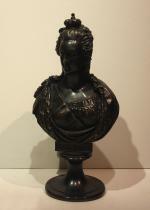 Sculptural bust of Russian Empress Catherine I". 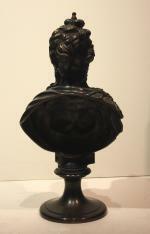 Bronze, casting, engraving, patination, mount. On the inside of the bust there is a round stamp from the Ministry of Finance: "For 10 years // 1867", the caster´s signature: "F.CHOPEN". Traces of existence. Russia, 19/20century. 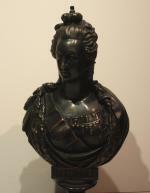 Inscription: on the bust is inscription in Russian " Ekaterina I", on the inside of the bust two stamps of foundry and ministry of Finance. Measurements: unframed h 10 5/8" (27 cm). Condition: in good condition, patina is in some places with traces of use.